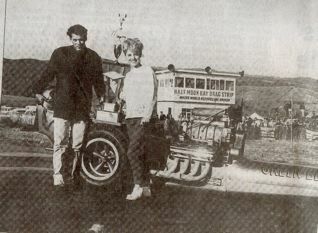 For Coastside kids, now adults, the Half Moon Bay Drag Strip remains a fond memory. In the late 1990s I interviewed Mark Andermahr, owner of the Half Moon Bay Bakery on Main Street. A fervent fan of drag racing, Andermahr had turned the walls of the bakery into a museum of historic photos honoring the old drag strip and its heroes. In the 1960s, Andermahr told me, he and his friends hitchhiked to the drag strip, perching themselves atop the roof of a barn at the south end of the drag strip. âAll we could see was the end of the race when the parachutes opened,â? Mark said. They looked like little dots getting bigger.â? (The âparachutesâ? helped slow down the super-fast dragsters). The races took place every other Sunday, the price of admission 90 cents. Jim McLennan âcould hardly wait for race dayâ? when he got behind the wheel of his 1936 Ford pick-up truck and headed from San Francisco for the Half Moon Bay Drag Strip where he opened the gates and awaited the crowds. McLennan remembered a press conference he scheduled at Half Moon Bay, inviting radio and television stations to cover a mock race matching his homemade âslingshot dragsterâ? that could go up to 150 mph against Art Arfonâs âGreen Monsterâ?. Arfonâs dragster with a painted monster baring its teeth on the front end was funny to look at but it was awesome, loaded with a gas-eating jet engine that reached speeds of 170 mph. âThe media didnât come to the press conference,â? McLennan said. âThey didnât know where the drag strip was!â? Back at the Champion Speed Shop in Colma a KPIX-TV cameraman and reporter arrived, apologizing for their failure to get to Half Moon Bay. âCan you show us the mock race now?â? the reporter asked. Game for anything, McLennan called Colmaâs police chief, who said, âSure, go ahead. You can run the thing, just put a couple of guys on the street to stop the traffic on the El Camino.â? âWe did it,â? McLennan said. âArt came down the street in the âGreen Monsterâ.â? He gave it the gas, and the noise was incredible. Two parachutes stopped the âMonsterâ? at the El Camino but the noise was so loud âthe phones were ringing off the hook at Colmaâs City Hall. McLennan also made valuable contributions to the safety of the sport. Through conversations with a San Francisco Airport fire official, he helped develop a âpro-helmet, fashioned out of fiberglass material, protecting the driver from burns. Northern California dragsters were the first to wear the new âfire suit,â? McLennan said. Using brakes to slow a dragster going 150-plus mph did not do very well so McLennan experimented with parachutes. Crouching in the truck bed of a pick-up, McLennan tossed out a 20-foot chute tied to a chain but he says, âIt wrecked the tail gate and everything else.â? Eventually he used a triangle parachute attached to a nylon âroll cageâ? which resembled a back pack. McLennan was among the first to use parachutes to slow down a dragster.